With the coming of the 1940s, the Brooklyn Dodgers were finally, after 20 years, in position to contend for the National League title. By 1940 the team had put together many of the components necessary to make a legitimate run at a pennant. The next few pieces of the puzzle would come together in 1940. With manager Leo Durocher now doing more managing than playing, the Dodgers needed a new shortstop. They found him in minor leaguer Harold “PeeWee” Reese. How good was he? He managed to make the Hall of Fame. 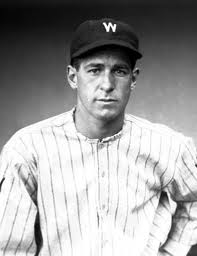 With Dolph Camilli again leading the team in home runs, RBIs, and WAR Brooklyn also had a first-rate first baseman. Cookie Lavagetto at third fell back somewhat from his 1939 campaign, but held firmly on to his position. Pete Coscarat was at second. He hit under .250, but was fourth on the team in home runs (nine) and fifth in RBIs (55). They may have been fourth and fifth on the team, but the Dodgers were looking, at the end of the season, for something better than nine homers and 55 Ribbys. The outfield had a full makeover. Although Gene Moore and Ernie Koy were still on the team (they got into a combined 34 games) the starters were totally different from 1939. New guy from 1939, Dixie Walker, now held one position. He hit above .300 and had 66 RBIs. Joe Medwick, a future Hall of Famer who’d won the Triple Crown, came over from St. Louis to take the second position. He’d fallen off from both the Gas House Gang pennant year of 1934 and the triple crown. He did manage to hit .300 in Brooklyn and had 14 home runs for the team. Thirty year old Joe Vosmik came over from the American League (Boston) to take the third slot. But the more important news, at least in terms of what would happen in 1941, was 21-year-old rookie Pete Reiser who got into 58 games, hit .293, and played with wild abandon in the outfield. Catcher Babe Phelps hit .293, but at 32 was aging fast. His backups included Gus Mancuso who was even older and Herman Franks who hit all of a buck-83. He caught a staff that included returning starters Fred Fitzsimmons, Luke Hamlin, and Whit Wyatt. As early as 1940, Hugh Casey was beginning to fill a relief roll. He still started 10 games, but appeared in 44. There was one significant arrival on the mound, Curt Davis. He’d come to Brooklyn from St. Louis in the same trade that brought Medwick to the Dodgers (Koy was one of the players going the other way). He went 8-7, but would make his arm known the next season. All this got the Dodgers 88 wins and second place in the National League (behind Cincinnati). By the end of 1940 most of the pieces were in place for a significant pennant run. There was still work needed at second. Another starter would be necessary. And with an aging catcher, new blood behind the plate was needed. The Dodgers would look to address all these issues before the 1941 season ended. In many ways the key year in the Dodgers late 1930s, early 1940s turn around was 1939. It ushered in a series of major changes that led ultimately to the 1941 pennant. So let’s us take a look at the 1939 team. Arguably the most significant change occurred in the dugout. Manager Burleigh Grimes was terminated at the end of the dismal 1938 campaign by new President and General Manager Larry McPhail. The addition of McPhail was in itself a significant change in Brooklyn’s front office. 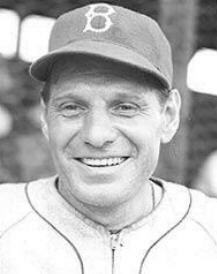 Grimes’ successor was player-manager Leo Durocher. “Leo the Lip” was loud, abrasive, fiery and hated losing (and I can’t believe I’ve never done anything on him). He brought a fire to the Dodgers that was lacking under Grimes (who could be fiery himself). A number of the players didn’t particularly like Durocher, but he had the respect of most of them. He and McPhail made for a strange and interesting pair leading the franchise. The infield saw one change. Pete Coscaret went from being the backup to playing the most innings at second, while former starter John Hudson became the primary backup middle infielder. With shortstop Durocher now managing, Hudson saw more action than a backup might normally see (he got into 109 games). Dolph Camilli and Cookie Lavagetto continued to hold down the corners of the infield. Lavagetto hit .300 and was second on the team in home runs (10) and RBIs (87). Camilli led the team in both with 26 home runs and 104 RBIs (his WAR and OPS+ also topped the starters). The outfield underwent a significant change in 1939. 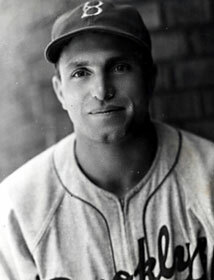 Of the 1938 starters, only Ernie Koy remained a primary outfielder. Gene Moore and Art Parks took over the other positions while Goody Rosen became a backup and Bud Hassett moved to the Braves. Of major significance for 1941, the Dodgers picked up a new backup outfielder when 28-year-old Dixie Walker was picked up on waivers from Detroit. He would, by 1941, become one of the more famous players on the pennant winning team. For 1939 he hit .280 with 83 total bases (0.3 WAR). Although Babe Phelps remained the primary catcher, the staff he handled added two major pieces to the pennant winning puzzle. Holding on to Luke Hamlin and Fred Fitzsimmons as starters, and moving Tot Presnell from spot starter to a major contributor helped Brooklyn, but the two new guys were key. One was Whit Wyatt. He was 31, had spent several mediocre years in the American League, spent 1938 in the Cleveland minor league system (Milwaukee), and was purchased by Brooklyn for 1939. He went 8-3 in 16 games (14 starts) and made the All-Star game. By 1941 he was the Dodgers’ ace. The other new guy was Hugh Casey. 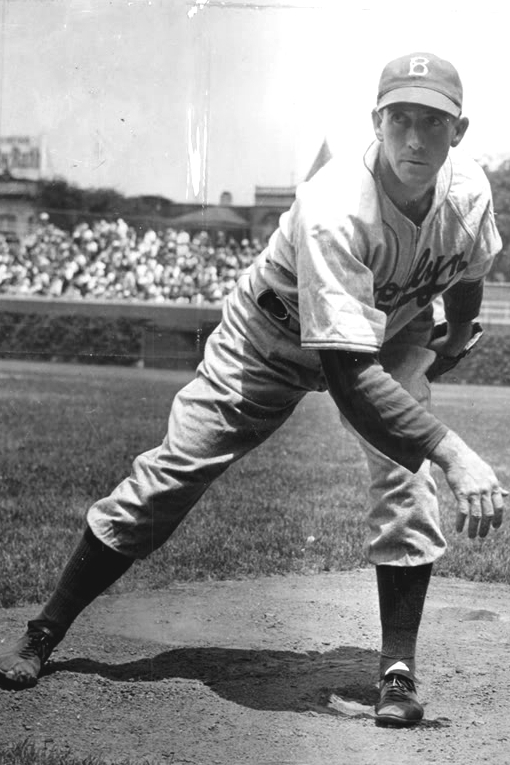 Casey was 25, had a cup of coffee with the Cubs in 1935, and became a full-time player only in 1939 after being picked up by Brooklyn from Memphis. Although known today primarily as a reliever, he started 25 games in 1939 and posted a 15-10 record, a 5.3 WAR, and managed to lead the National League in hit batsmen with 11. The result of all this was a third place finish and a winning season for the Dodgers; their first in several years. Much of the “Daffiness Boys” syndrome was gone and they were emerging as a legitimate contender in the National League. By this point half the infield was in place, much of the pitching staff was available and the first of the outfield was on board. With Leo Durocher piloting the team, and McPhail ready to make the necessary acquisitions, they were finally moving in the right direction. As an aside, there was also one other notable addition to the Dodgers, although it didn’t change the play on the field. The 1939 season saw Brooklyn pick up a new play-by-play radio announcer. Red Barber joined the team in the booth in 1939. As bad as the 1937 Brooklyn Dodgers were, the 1938 version was even worse. They dropped all the way to seventh in 1938 going 69-80 to finish 18.5 games back (which is actually closer than in 1937–the ’37 Giants won 95 games, the ’38 Cubs only 89). Their Pythagorean said they should have finished 74-75, so they underperformed. In hitting they finished sixth in most categories but first in stolen bases and walks. In fact they had 611 walks and only 615 strikeouts for the season (and if you exclude pitchers they actually walked more than they struck out), which helped them to second in OBP. The pitching was also bad. The staff consistently finished about sixth in most categories coming in high in shutouts (3rd) and having the third lowest walk total. Even Hilda Chester might have had trouble rooting for this team. But a couple of significant changes occurred. First, Dolph Camilli came over from Philadelphia. He posted 24 home runs and 100 RBIs, both of which easily led the team. His 118 walks also led the team (as did his 101 strikeouts). His OPS and OPS+ also led the Dodgers, while his WAR was second on the team (but first among position players). He replaced Bud Hassett at first, but Hassett moved to the outfield replacing Heinie Manush (who got into 17 games), so effectively Camilli replaced Manush. Manush hit for a much higher average in 1937 than did Camilli in 1938, but had only about half the WAR and drove in 73 with four home runs. The other big infield change saw Leo Durocher take over at short. 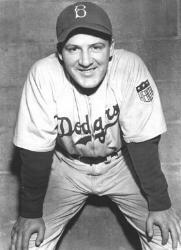 Durocher’s numbers weren’t better than Woody English who’d held down shortstop in 1937, but Durocher became team captain and brought a new competitive attitude to the team. Also in the infield Cookie Lavagetto moved from second to third and John Hudson replaced him at second. Lavagetto replaed Joe Stripp making Hudson essentially Stripp’s replacement. Hudson’s OPS+ and WAR weren’t very good, but they were better than Stripp. The outfield was entirely different. The aforementioned Hassett was now on one corner. Goody Rosen took another and former college football standout Ernie Koy had the final position. Koy almost hit .300 and his 11 home runs were second on the team, as were the 76 RBIs. The bench was long in 1938. Merv Shea and Gilly Campbell were the backup catchers while former backup Roy Spencer got into only 16 games. The 1937 starting shortstop Woody English now rode the pine and Pete Coscaret was pushing Hudson for more time at second. Hall of Famer Kiki Cuyler was, along with Tuck Stainback, the primary backup outfielder. He was 39 but could still hit in the .270s. Other than Cuyler they didn’t do much. The battery consisted of Babe Phelps behind the plate and nine primary pitchers. Phelps hit .300 with no power and 1.7 WAR (that was eighth on the team). The primary starters were three holdovers from 1937: Luke Hamlin, Fred Fitzsimmons, and Van Mungo (of Van Lingle Mungo song fame). Fitzsimmons’ 4.4 WAR led the team and Hamlin’s 3.4 was third. The new guy was Bill Posedel who poured kerosene on an already combustible staff by going 8-9 with an ERA north of five. The bullpen (those with 20 or more games pitched) saw Fred Frankhouse as a leftover from 1937 and Tot Presnell, Vito Tamulis, and Max Butcher as the new guys. Both Tamulis and Presnell posted ERA+ number above 100. Part of the problem lay with manager Burleigh Grimes. Essentially everyone knew he was a lame duck and his authority in the clubhouse waned. He’d been a good pitcher for a long time (eventually making the Hall of Fame) but wasn’t much of a manager. He came immediately into conflict with Durocher who, it was assumed, was manager-in-waiting. It didn’t help team chemistry. There was one significant off field addition also. In 1939 Larry McPhail became President and General Manager of the Dodgers. He would change the culture of the team greatly. So where were we when 1938 came to a close? Much of the infield was in place. Camilli was at first and Lavagetto at third. Both were playing well. 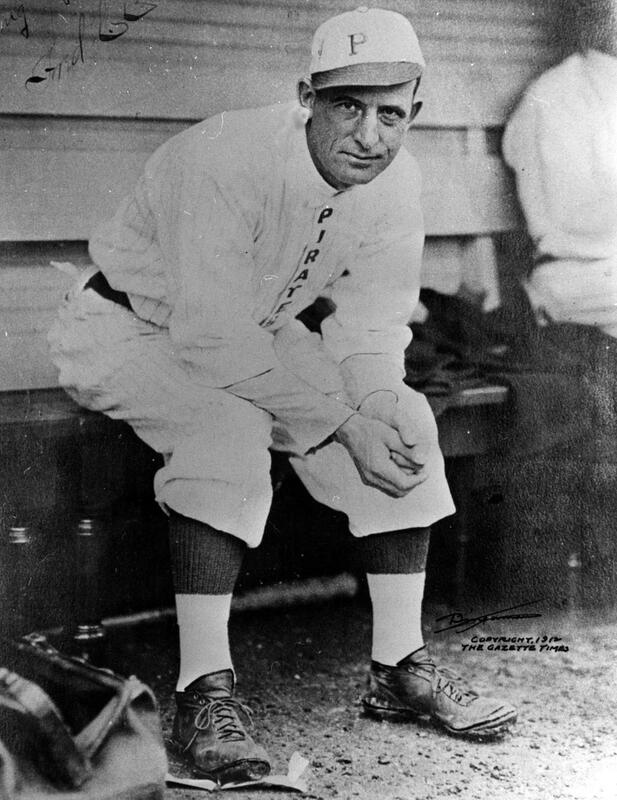 Durocher was at short, but would leave the position after the end of the season to become manager. Neither the 1941 outfielders nor the catcher were yet in place. The pitching staff was beginning to add the first parts of the pennant winning group in holdovers Fitzsimmons and Hamlin, but the mainstays of the 1941 staff were still missing. Much of this would change in 1939, making it a key year in the rebuilding process. There are a lot of ways to construct a winning team. You can create it internally through a farm system. You can trade for the right players. You can out right buy players from another team. In the last 50 or so years you can go through the free agent market. And of course you can use any combination of these to build your team. I want to take something of an extended look at how one team did it. As a Dodgers fan I’m much more familiar with their doings than with other teams, so it’s reasonable for me to look at how the Dodgers built a winning team. In this case I’m going to single out the 1941 Brooklyn team that got to a World Series, then faltered, but laid the foundation for the team that was generally in contention through the remainder of the team’s time in Brooklyn (1957). To start, here’s the main part of the roster of the pennant winning 1941 team. Infield (first around to third): Dolf Camilli, Billy Herman, PeeWee Reese, Cookie Lavagetto. Outfield: Pete Reiser, Joe Medwick, Dixie Walker. The catcher was Mickey Owen. Starting pitchers (guys with double figure starts): Kirby Higbe, Whit Wyatt, Curt Davis, Fred Fitzsimmons, Luke Hamlin. The bullpen (guys with 20 or more appearances from the pen): Hugh Casey and Mace Brown (and Casey also had double figure starts). And the bench (guys with 50 or more games played): Lew Riggs (primarily a 3rd baseman), Pete Coscarart (primarily a 2nd baseman), Herman Franks (a catcher), and Jim Wasdell (and outfielder). The manager is Leo Durocher. Keep all those names in mind as we go through the process of putting this team together. These are the guys we’re ultimately looking for in order to create a winning team. Now here’s a look at the same team in 1937. The order is the same (infield, outfield, catcher, starters, bullpen, bench, manager): Bud Haslett, Lavagetto, Woody English, Joe Stripp, Heinie Manush, Tom Winsett, John Cooney, Babe Phelps, Max Butcher, Hamlin, Fred Frankhouse, Waite Hoyt, Van Mungo, Fitzsimmons, Roy Henshaw, George Jeffcoat, Jim Lindsey, Gibby Black (outfield), Jim Butcher (2nd, 3rd, and outfield), Roy Spencer (catcher), Lindsay Brown (Short). Burleigh Grimes is the manager. The ’37 Dodgers finished sixth of eight teams in the National League. They were 62-91, 33.5 games out of first and 17.5 out of fifth place. They finished sixth in batting average, OBP, OPS, runs, and hits; seventh in slugging; dead last in home runs. At least they were third in stolen bases (all of 69) and second in doubles. The pitching was worse. They were seventh in ERA, runs, earned runs, complete games (which meant a lot more in 1937 than it does today, and last in shutouts. At fourth in strikeouts, they managed to get into the top half of the National League. And to top it off they were dead last in fielding percentage. In short, the Daffiness Boys stunk up the place. Five years later they won the NL pennant. A lot of things changed. But a few things remained. Off the 1937 squad, Cookie Lavagetto remained. He’d moved from second to third. Although many of his traditional stats had regressed, he maintained an OPS+ of 110 (down one point from 1937) and his WAR (BBREF version) moved from 2.5 to 2.7. Luke Hamlin was still around also. His ERA was up, his wins down, his ERA+ was down 25 points, and his WAR had gone from 3.4 to a negative. Fitzsimmons was also there. By 1941 his ERA and ERA+ were much better although his WAR was unchanged. So even the holdovers from 1937, especially Hamlin, weren’t doing much to help the team make its five-year rise. To do well, an entire overhaul needed to occur. In the next few posts I want to look at that overhaul. Mike Piazza, Jeff Bagwell, Tim Raines, Curt Schilling, Roger Clemens, Barry Bonds, Lee Smith, Edgar Martinez, Alan Trammell (one of the last chance guys), Mike Mussina, Jeff Kent, Fred McGriff, Larry Walker, Gary Scheffield, Mark McGwire (the other last chance guy), Sammy Sosa, Nomar Garciaparra. New guys: Ken Griffey Jr., Trevor Hoffman, Jim Edmonds, Garret Anderson, Brad Ausmus, Luis Castillo, David Eckstein, Troy Glaus, Mark Grudzielanek, Mike Hampton, Jason Kendal, Mike Lowell, Mike Sweeney, Billy Wagner, Randy Winn. And in related news, the Hall trustees voted not to expand the number of players a writer could vote for from 10 to 12. So the maximum number of players any writer can list on his ballot is 10. My thoughts at a later time. 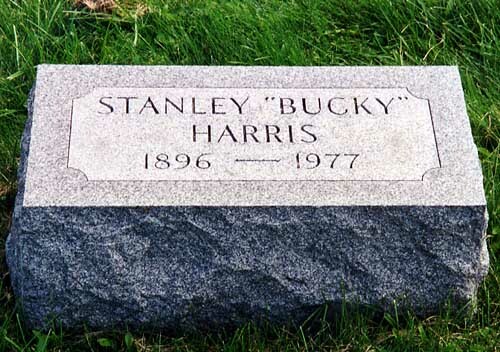 1 Stanley Harris was born in 1896 in Port Jervis, New York and grew up in Pittstown, Pennsylvania. 2. He left school early to work in a coal mine. 3. He played both basketball and baseball when not working and came to the attention of Hughie Jennings, Tiger manager and Pittstown native. He was signed to his first contract at age 19. 4. He spent 1916 through 1919 in the minors playing primarily with the International League’s Buffalo Bisons. 5. He was signed by Washington in 1920, became the Senators regular second baseman in 1921. 6. He became player-manager of the Washington Senators in 1924 at age 27. At the time he was the youngest player-manager in American League history. He’s still the second youngest behind Lou Boudreau. 7. His 1924 and 1925 Senators won the American League pennant and the 1924 version won the World Series. 8. In 1929 he was traded to the Tigers where he both played and managed. He last played a game in 1931, but managed Detroit through 1933. He also managed Boston, the Senators (for the second time), and the Phillies between 1934 and 1943. 9. He was fired from Philly in 1943 and spent the next three years as manager and general manager of the Buffalo Bisons. During this period he was one of several witnesses to appear before Judge Landis concerning the Phillies’ owners gambling on baeball. The upshot was the banning of Phils owner William Cox from baseball. 10. He was hired to manage the New York Yankees in 1947 and won the World Series that season. In 1948 he finished third (two games back and with 94 wins) and was fired. 11. Harris managed minor league San Diego in 1949, then completed his managerial career by managing Washington for a third time and Detroit for a second stint. 12. He worked in the Red Sox front office from 1957 through 1960. In 1959 he became general manager and was instrumental in bringing Pumpsie Green to Boston thus integrating the last Major League team. There is some dispute about whether Harris was committed to integration or simply thought the team would be better with Green on the roster. 13. He served as a scout (White Sox) and a special assistant (Senators–now the Rangers) until his retirement in 1971. He was elected to the Hall of Fame in 1975 and died in 1977. Just a short note today. My son alerted me to a press release from Topps. Apparently they are producing a set of “Pride and Perseverance” cards to celebrate MLB players who “triumphed in spite of disabilities.” The set includes such old timers as “Dummy” Hoy (who, in a case of political correctness they insist on calling “William”) and such new guys as Jim Eisenreich. It seems there will be 11 of them. There was no picture. Passed along for anyone interested. You can find info on Topps website. 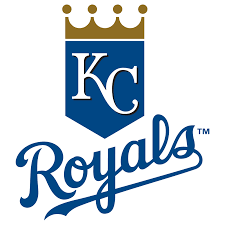 Congratulations to the Kansas City Royals on their World Series win. And condolences to all the Mets fans (sorry, Bill). Here’s a few quick thoughts on the Series from someone who had no rooting interest in the outcome. First, the Mets appear to be a very good team that has a chance to continue in contention if things go right for them (never a given). They have four strong arms that can keep the team in games. Of course that was true of the 1986 version, the last Mets team to win it all, and none of the big names (Darling, Gooden, Ojeda) became dominant starters over a long period of time. As long as the current Mets big four are healthy and signed it’s probably a good thing for New York. They have got to find someone who can catch the ball and who can throw in a straight line. Errors hurt the team and sometimes I wondered if they knew what to do with a baseball once it was hit to them. Hopefully the Series dampened the enthusiasm to give Murphy a ton of money. He had a great pre-Series playoffs and looked poised to make a boatload of cash. Frankly I was afraid some team (my Dodgers need a second baseman and have lots of money so they came to mind) would pay him a lot more than he was worth and be stuck with another awful contract. I did like seeing David Wright get a chance to play in a World Series and hope he gets another. He’s been a stalwart for a long time (in baseball terms) and I’ve always kind of liked him. And now Kansas City. I have no idea how to explain this team. They remind me of a Deadball team in so many ways. They string together hits, run rampant on the bases, steal a lot, don’t strike out a bunch, play good defense. All of those things describe John McGraw’s 1912 Giants (with proper deference to the defense of the era). But then the Royals hit for power (but not Ruthian power) and have a less than dominating staff, neither of which describe the 1912 Giants. In some ways they remind me most of the 1996-2003 Yankees. They do many of the same things well and have no genuine superstar (Jeter was a star and became a superstar as the Yanks kept winning–the same can happen to a Royals player if they keep winning). I don’t expect them to have the same staying power because they don’t have the same quality pitching, especially among the starters, but the two teams are much alike (but certainly not exact copies). All in all I enjoyed the World Series. Kansas City is fun to watch. One of the announcers last night kept comparing their enthusiasm to a youth baseball team. I kinda like that. It’s nice to see a bench excited. Now on to next season and Go Dodgers. You are currently browsing the Verdun2's Blog blog archives for November, 2015.